A Nuyorican comic book artist down on his luck becomes the city's newest superhero in El Coquí Espectacular and the Bottle of Doom. Alex Nuñez (Miles Blitch) searches to discover his Boricua identity and prove to himself that he is not just “Sorta Rican,” the stereotype assigned to him by his erstwhile high school bully Junior/current nemesis El Chupacabra (Ricky Mars). So he becomes El Coquí, a superhero named for the iconic Puerto Rican tree frog, who protects Sunset Park. He dons his deceased father's vejigante mask, lies about his whereabouts to his mother (Juliet Salazar) and corporate brother (Jake McCook), and hits the rooftops. His noble, if poorly-executed, acts of heroism soon earn the attention of the Twitterverse and of street-savvy Dominicana Yesica (Cristina Vigil). Self doubts and writer’s block are always worthy enemies, but his greatest challenge is how best to portray El Coquí — as a hero of el viejo Barrio in the face of Brooklyn's gentrification, or as a product to sell to the highest bidder? Matt Barbot was born and raised in a Puerto Rican family in Brooklyn, New York where he attended Jesuit High School and began writing and performing. He earned degrees in Creative Writing and Theater at Franklin and Marshall College in Lancaster, PA, and an MFA from Columbia University School for the Arts. Barbot's first play, Infallibility, which focuses on questioning religion, faith, and identity, was produced in 2014 as a part of the annual New York International Fringe Festival and was one of Indie Theater Now’s Best of Fringe NYC 2014. Barbot's best known play, El Coquí Espectácular and the Bottle of Doom, premiered at the Two River Theater on January 8th, 2018. 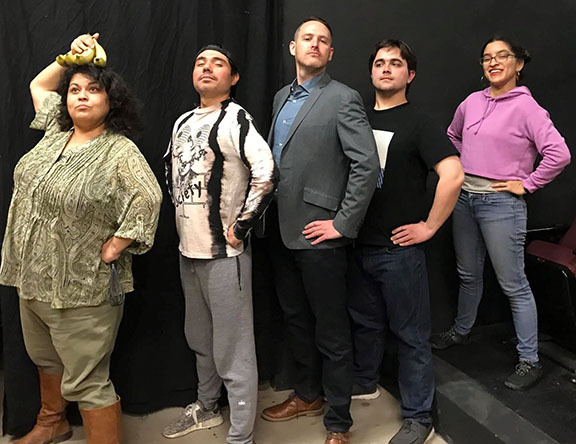 The play was performed at The Brick's Comic Book Theater Festival, the Julia De Burgos Performing Arts Center, and the Sheen Center Theater Festival of Catholic Playwrights. Barbot has authored eleven plays to date. Thursday • April 11 • 7:30 p.m.
Friday • April 12 • 7:30 p.m.
Saturday • April 13 • 7:30 p.m.
Sunday • April 14 • 2:00 p.m.
Sunday • April 28 • 2:00 p.m.